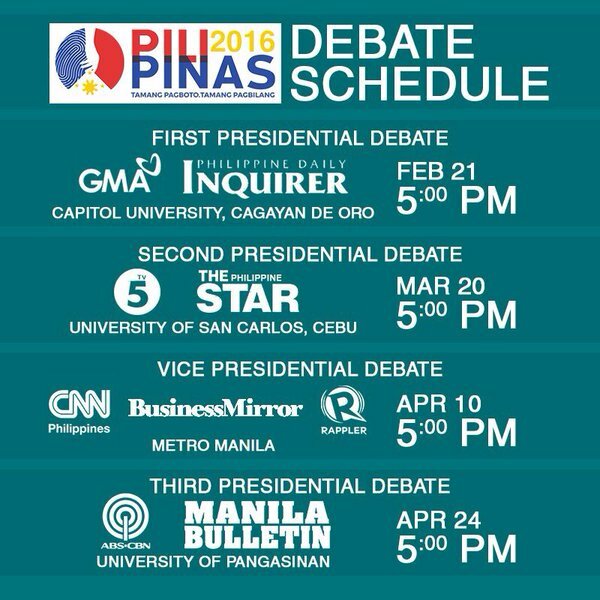 MANILA, Philippines - The highly anticipated first leg of PiliPinas Debates 2016 happens today, February 21, 2016 at the Capitol University in Cagayan de Oro City. GMA News and Public Affairs brings the first ever 360-degree livestream of a live event in the country. The special debate was developed by the Commission on Elections (Comelec), Kapisanan ng mga Brodkaster ng Pilipinas (KBP) with GMA-7 and the Philippine Daily Inquirer sponsored the first presidential debate for May 9, 2016 elections. Note: The full video replay courtesy of GMA Network is now available on this page. GMA-7 forerunner in technology and a subsidiary GMA New Media, Inc. (NMI) set-up the 360-degree livestream which is available for near-real-time viewing on GMA News Online. The technology will allow any web user to pan the camera view around the venue in near-real-time. Moderating the debate are award-winning GMA anchors Mike Enriquez and Jessica Soho along with John Nery of the Philippine Daily Inquirer. All five presidential hopefuls Vice President Jejomar Binay, Davao City Mayor Rodrigo Duterte, Senator Grace Poe, former Interior Secretary Mar Roxas, and Senator Miriam Defensor Santiago will battle it out in four separate rounds of the debate. Know more about presidential candidates here. Topics to discuss includes development and poverty, peace and order, track record, constitution, and Mindanao issues. Each speaker will then be given 90 seconds to present their answers for each question and rebuttals from other candidates will follow. Comelec chairman Andres Bautista said it was patterned after the US Republican debates and in accordance with the international best practices and was properly agreed to by all the organizers. Aside from the CDO debate, Comelec will also organize second presidential debate on March 20 at the University of San Carlos (USC) in Cebu City. This will be sponsored by TV5 and The Philippine Star. The next and final leg of presidential debate will be handled by ABS-CBN and Manila Bulletin on April 24 at the University of Pangasinan. The vice presidential debate is set on April 10 at the University of Santo Tomas (UST) to be organized with the help of CNN Philippines, Business Mirror and Rappler. Who will dominate the #PiliPinasDebates2016? Express your thoughts in the comment section below.